Review: Did you set a resolution to use less plastic or live more consciously, this year? Then, this is your guide! 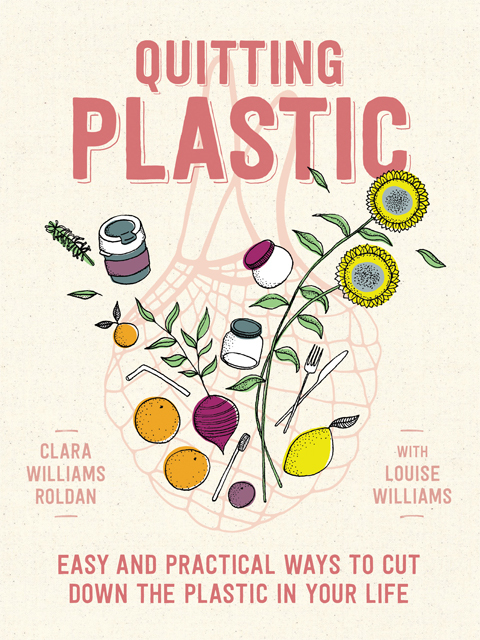 Quitting Plastic is an easy to read and informative guide on living a plastic-lite or plastic-free lifestyle written by Clara Williams Roldan with her Mum, Louise Williams and Carla's two sisters. Written by a truly informative team the gorgeous book provides instructions on quitting plastic with new babies through to conscious shopping, fashion and cleaning. It's simple to become plastic aware as Quitting Plastic breaks down all aspects of living plastic-lite so you can decide what to change first and how far you take quitting plastic. Ideally you already recycle but Quitting Plastic informs that "only nine per cent of all plastics we've manufactured to date has been processed for re-use" which is why it's best to start today with the suggested easy-to-avoid items: plastic bags, single-use straws, coffee cups and bottled water. Quitting plastic or becoming more aware of the plastic we are consuming is not only a satisfying processes but the indirect result often means you end up eating healthier and fresher food as well as decluttering your home with less need to find space for rubbish. Look, if the Queen of England (influenced by the one the only David Attenborough) can cut plastic you can too and the easiest way to start is by reading Quitting Plastic – it will answer all your questions along with providing useful tips! Clara Williams Roldan is a young policy and legislative advisor in NSW Parliament. Witnessing parliament at work has convinced Clara that lots of individual actions which may seem small at the time can drive important changes in our lives. Clara is writing with her mother, Louise Williams, a Walkley-award winning journalist and writer with a lifelong interest in environmental protection. Louise has served on the Waste and Recovery Strategic Reference Group of the Northern Beaches Council in Sydney and is co-founder of the Baringa Bush Community Garden. She is the author of A True Story of the Great Escape.